The word “exercise” makes many of us cringe thinking about all the efforts that we will need to put in just to get that slim and fit body we long for. But what if we were to tell you that you don’t really need to take too much trouble to get fit? Well yes, it is possible. 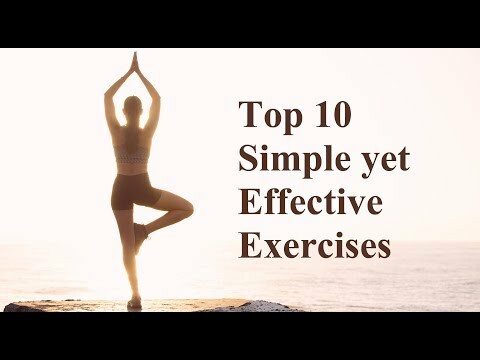 Here is a list of 10 simple exercises that are just as effective as a proper workout routine, while not being too expensive or tedious to implement. Walking is such an everyday activity that we never take too much notice of it. However, walking at a steady pace, with mindful control over your body can actually work wonders. The best part is that you don’t even need to set aside a fixed time to do this exercise. You could just walk to work or to the market or to any place that you can possibly reach without using a vehicle. And it will help you save money too! Your body needs more energy to stay in an erect standing position than it takes to stay seated. The body burns fat to produce this energy, and so, merely using up energy standing rather than sitting helps you lose weight. So, if it is not possible to walk to your destination, and you do need to take some mode of transport to get there, it is preferable to stand while you wait for your conveyance to arrive. Even more energy is required to climb than what it takes to stay standing. So when it comes to choosing between the escalator and the stairs, it would be wiser to take the stairs and lose some weight rather than just being carried upstairs with little or no movement on your part. Now-a-days, life has become extremely convenient. You can have your groceries delivered right till your doorstep, no matter where you are. But this convenience has also made us extremely lazy. Once in a while, you should try to take a walk down to the grocery store and carry your groceries home yourself. It may tire you out a bit, but it will definitely help you get a little more active and fit. Cleaning up after yourself is not only a socially responsible thing to do, but it also works to your own benefit. When you choose to do the housework on your own, you are cleaning out dust and dirt that may make you ill. But in the meanwhile, you end up exercising almost every part of your body as you pick up things, put them away, sweep the floor, wash your clothes, take the trash out, and do all the other little tasks needed to keep your house clean and hygienic. So why not do the chores yourself, save all the money you would have spent getting them done by someone else, and get healthier in the process! We usually either sit or stand for most of the day, and never really stretch or flex the muscles in our legs much. This leads to stiffness and knee problems in middle and old age. Besides, bending over too much will damage your back. Squatting helps to stretch out the muscles in the back of your legs, and loosens up the stiffness that comes from standing, and walking all the time. So try squatting a little instead of bending over right from the waist. You’ll get used to it in a while, and will be doing your lower body a big favor. Though this might seem like a strange bit of advice, you’ll find that you don’t really need to go to the gym to be able to do all those exercises. For example, you could use a chair or stool to do leg lifts while sitting, do a plank or push-ups against the side of a table or the window sill, or lift a few boxes or bags as weights to increase arm strength. So you cannot make the excuse of not having time for the gym. Your home is your gym. All you’ve got to do is use it well. Who says that play is not as important as work! When it comes to your health, work may wear you out, but play will energize you again. Sitting for anything between 7-9 hours at a school or work desk, and stressing over assignments, targets or finances may keep your mind busy, but only makes your body lethargic and stiff. On the other hand, engaging in sports will exercise your body a lot. Games and sports can keep both body and mind alert, active and healthy. So try to set aside some time for the child in you, and enjoy yourself while exercising in the process. Breathing is another activity that we mechanically repeat over and over again, without realizing its importance. We tend to breathe to only half of our lungs’ capacity, and so, allow them to get weaker over time. Breathing deeply not only strengthens your lungs and diaphragm, but also increases the oxygen supply to your body. This extra oxygen helps burn down more fat, and so, helps you shed a few kilos and become fitter. The idea of dancing to get fit has caught on as a trend in recent times. Dancing keeps the body flexible and strong. The rapid breathing, and constant energy production also burns fat. Besides, music and movement while dancing brings happiness to the mind, and relieves you of any stress that may ruin your health. So, when you dance, you’re not only having fun, but also getting healthier, losing weight, and keeping your body fit and active. We hope that we have helped you to take on a new approach towards health. If you make these 10 simple exercises a part of your daily routine, you will definitely have begun your journey towards a fitter and healthier tomorrow. Exercise might sound tiring and boring at times but WeBeingFit brings you top 10 tips which are easy yet effective for your body. Just make sure you add these tips in your routine and you will see the results.